IMG_1462, originally uploaded by All Things Mimi. Sunday I decided it was time to conquer my fear of baking cakes. I have had some ugly experiences trying to bake cakes at this altitude (7500 feet above sea level) so it was with trepidation that I headed in the kitchen to attempt this project. Below is the recipe I followed. The person who wrote this recipe halved it for cupcakes. I don't remember which blog I got this from, but if anyone recognizes it, please let me know so I can give the credit to the right person! I did the whole recipe and baked it in a 9x13 pyrex baking dish. It is really more like a muffin batter instead of a cake batter- which might be why I didn't experience the same problems I had with previous cakes. At any rate this is a delicious cake and you really should make one for yourself. And if you can get ahold of homemade cream cheese, the icing will be off the chart! Cook's Illustrated's inspiring recipe fills a 9x13 pan. To make a dozen cupcakes, I cut this recipe in half. Half would also work for 9x9 pan. With a food processor (see KITCHEN TIPS), grate the carrots, transfer to another dish. Add the sugars and eggs to the food processor and process for 20 seconds. With the food processor running, pour the oil into the food processor in a slow stream, then process for another 20 seconds. 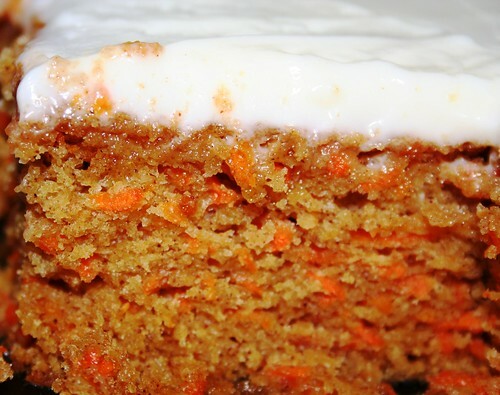 Stir this mixture and the carrots into the dry ingredients until no flour streaks remain. Pour into prepared 9x13 or muffin tins. For 9x13, bake for 35-40 minutes (rotate half-way through) or until a knife inserted in the center comes out clean. For cupcakes, bake for about 30 minutes. For 9x13, let cool to room temperature. For cupcakes, let cool about 10 minutes, then remove from tins. For 9x13, Cook's Illustrated suggests inverting the cake onto a wire rack, peeling off the parchment, then inverting onto a serving plate. In the food processor (washed), mix the cream cheese, butter, sour cream and vanilla til smooth, wiping down the sides as needed. Add the powdered sugar and process til smooth, just a few seconds. NOTE: Half the icing was more than enough for a dozen cupcakes. Great job, that cake looks delicious and so moist and fluffy. In such high altitudes there is a formula used to bake cakes. I know because my mom bakes a lot and Mexico City is more 2,000 meters high. I'll look around to see if I can find it.